I periodically work through a series of exercises in a book. This process is important to me as I explore new techniques or refine skills. In December I saw a new, exciting book mentioned on Beth Berman's blog: Finding Your Own Visual Language by Dunnewald, Benn, and Morgan. 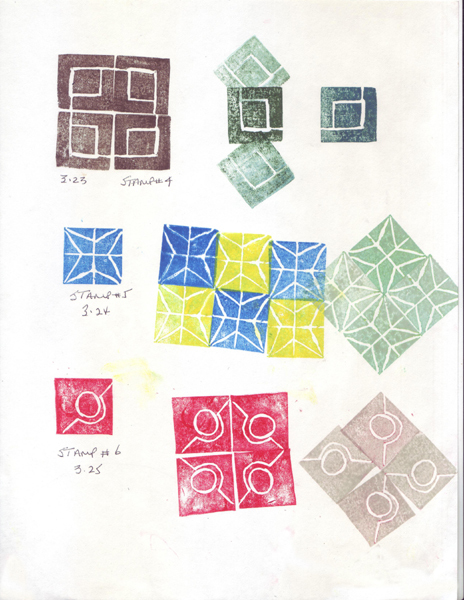 Although I draw and paint on paper, I also make stamps and stencils to use on paper or fabric and love using corn dextrin and soy wax resist with procion MX dyes to make fabrics for my projects. Jane Dunnewold was the Chair of the Suface Design Studio at Southwest Craft Center in San Antonio Tx when I took my first fabric dying class and a silk painting class in the early 90s. I love her fabrics and devoured her books Complex Cloth and Art Cloth. That made this book even more appealing. 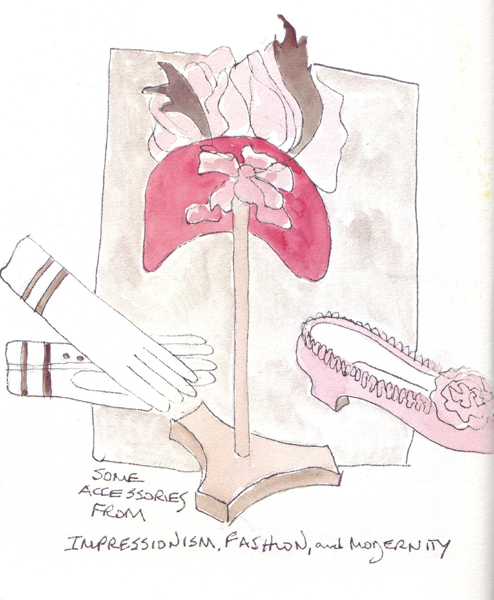 There are 16 Visual Exercises in the first section of the book, and I am currently working on Exercise 2. 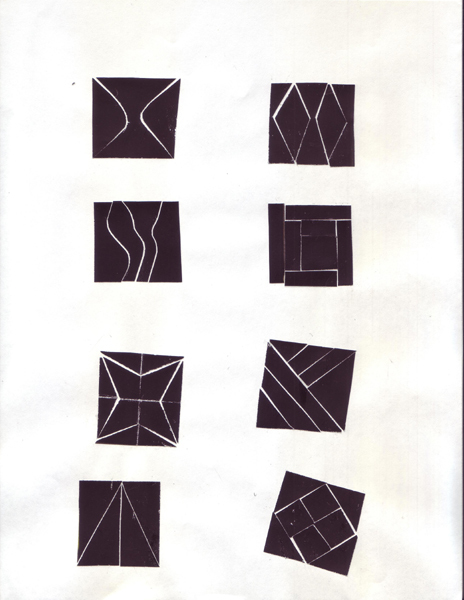 In Exercise 1 - Splitting Shapes, I selected a square as my shape and made many 1.5" squares from black paper. Each square was cut into at least 3 pieces and then reassembled as a square and glued in place. I made 8 and then just kept going to do another 8. 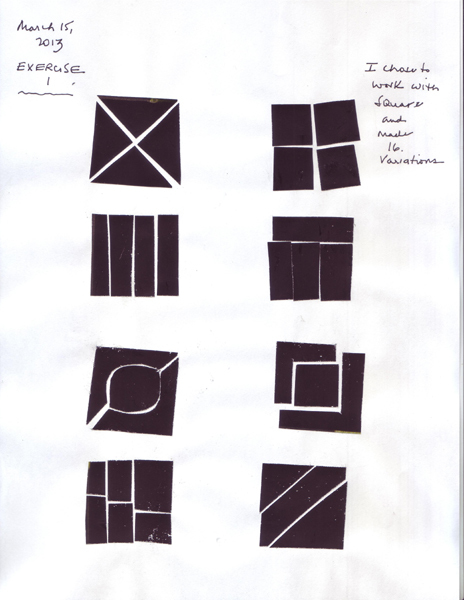 Here are my two pages of "fractured squares." Exercise #2 is 30 Days of Cutting Stamps. I make stamps from fun foam, even complex ones to create multicolored images. 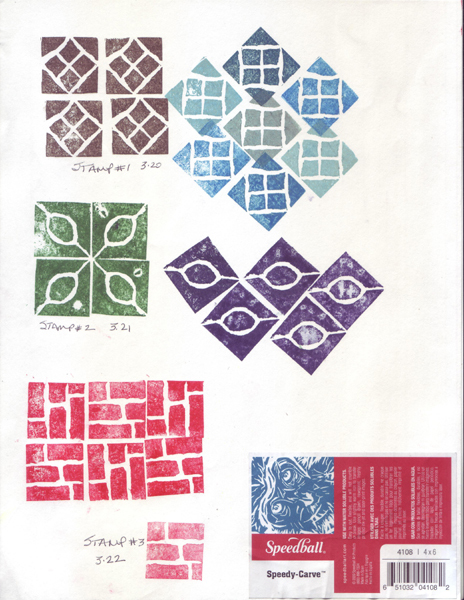 But I have no experience carving stamps, so I plan to use Speedy-Carve and Moo Carve and my Speedball Lino Cutter Assortment for this exercise. I can cut my 4 X 6 X 0.25" Speedy-Carve into 24 1X1" pieces and then make 6 slightly bigger stamps with Moo Carve to complete the series. I also work in sketchbooks that are 8 X 8 max, so little stamps work better for me. I don't have a black stamp pad - so these images were made with Staz-On and Colorbox pads. I feel more confident about the carving lines with each one. This is good practice! The Metropolitan Museum of Art in New York has a wonderful new exhibit (through May 27th) entitled Impressionism, Fashion, and Modernity. The exhibit explores how the fashion of the time influenced the impressionist painters, in both portrait paintings (where presumably the subjects were wearing these clothes) and in paintings set in different venues. There are many dresses, men's jackets and pants, and accessories. 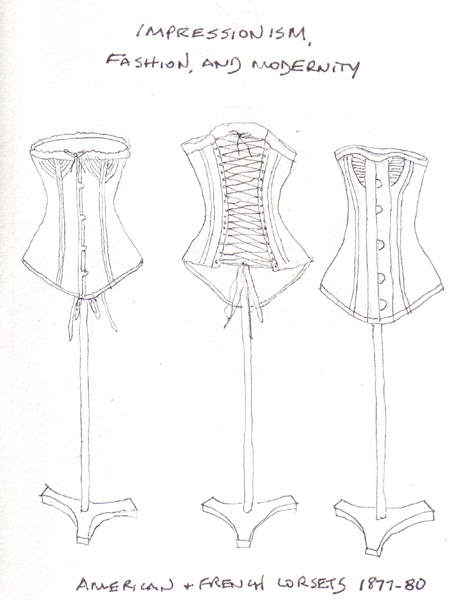 I sketched accessories - loving the composition of the corsets lined up on forms and items enclosed in one long glass case. Yesterday Pat, Benedicte, and I met Gwen and Phil Diehn for brunch and a visit to the Frick Collection. They currently have 7 Piero Della Francesca paintings (through May 19th) and 3 rooms of drawings: The Impressionist Line from Degas to Toulouse-Lautrec. All of the drawings are on loan from the Clark Art Institute (through June 16th). There were at least a dozen that I wanted to draw, but finally chose Degas After the Bath - 1891-2. I used a 2B graphite pencil and tried to replicate the heavier lines in the original. These may be the final four in my Elephant Series. It was a good challenge for me during February and the first half of March, especially since I limited my activities as I recovered from presumed influenza that occurred in spite of a flu shot. The numbers on the paper aren't very accurate, since I missed a drawing and that shifted the numbers. These are really #17, 18, 19, and 20. 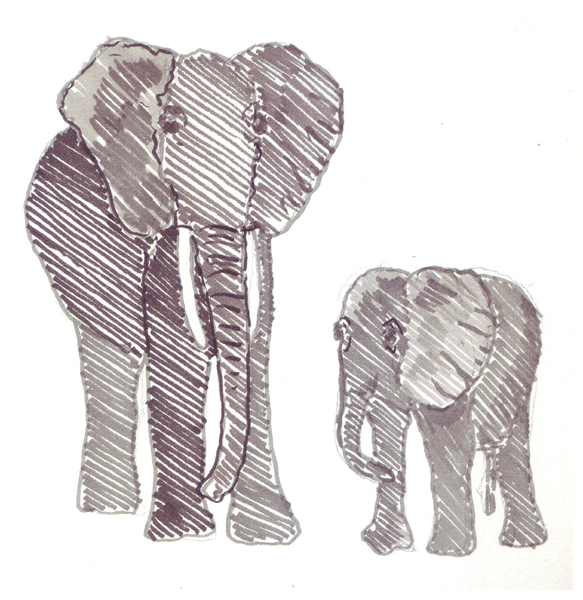 These elephants were drawn from frames in the PBS Nature special entitled Echo: An Elephant to Remember. I love the documentary and I'm fascinated with the ability to pause and sketch. They were all done on Fabriano Artistico 140 lb soft press watercolor paper with different media. Although frequently frustrating, I'm very glad that I pushed myself to explore and use different tools. Echo and her Mother were drawn in pencil and then colored with various shades of gray Pitt artist pens (B). I never use markers, so I decided to add color with lines - and couldn't bring myself to fill them in as if I were using crayons. I was dreading trying my pastels - and spent some time watching online videos re: using oil pastels and pan pastels. Oil Pastels (Echo following her Mother): My friend Melanie gave me a set of student grade oil pastels and I used the black, gray, and white pastels to color the elephant, and then blended the colors with a white acrylic eraser. 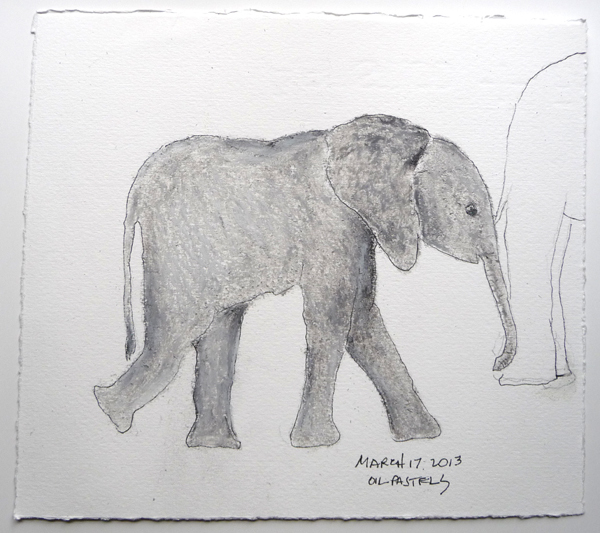 I photographed this elephant because I didn't want to put the pastel on my scanner plate. Pan Pastels: My friend Pat gave me her pan pastels because they were too messy. I tried Teri's once before and liked the creaminess of them, so I accepted graciously. 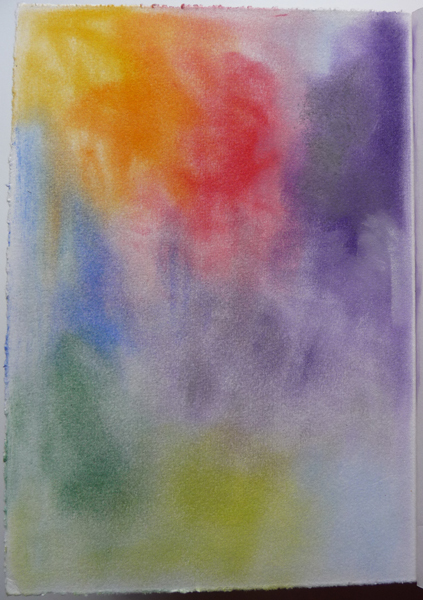 This morning I mixed all of the colors I had, in order to practice the application and blending, and then decided to use gray, white, and some purple for the darker areas because I don't have black. 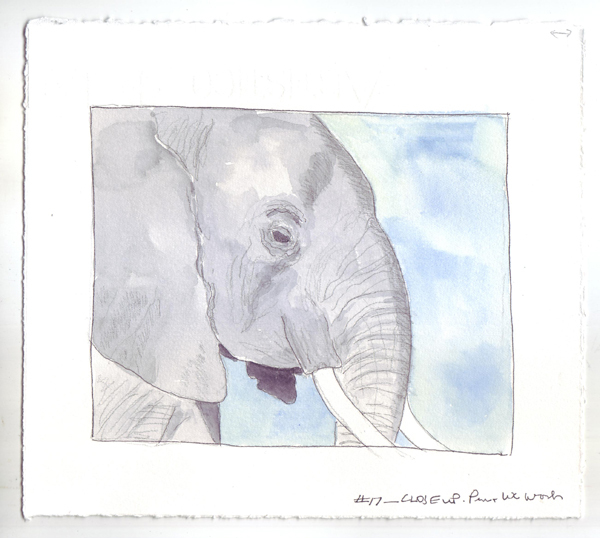 I started missing my watercolor paints and ended the series with a closeup painting of an elephant head. What I Learned: I LOVE painting with watercolors, and also enjoyed drawing with soluble graphite, watercolor pencils, and watersoluble inks. Although I decided that there will be minimal painting with acrylics, drawing with markers, or using pastels, I am very happy that I challenged myself. 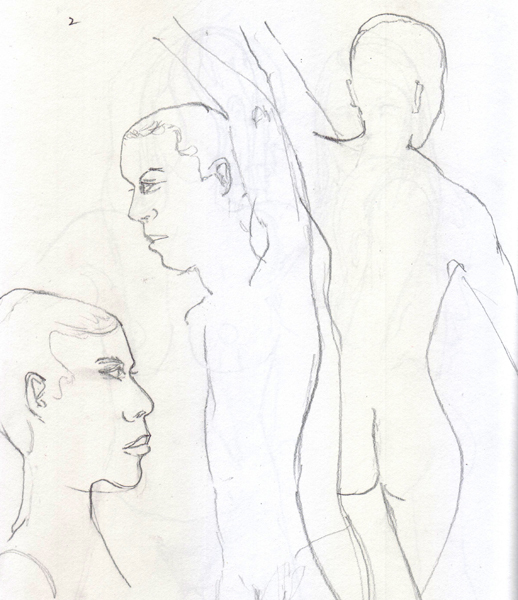 We had one male and one female model at the Society of Illustrators Sketch Night the last time that I attended. 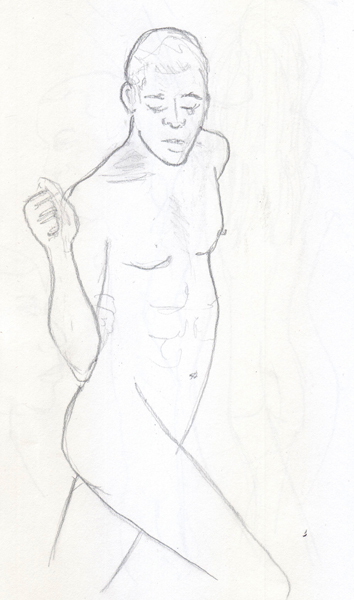 I rarely get to sketch male models, and sketched him as much as possible. Here are some of my drawings. I'm still working in an 8.5 x 11 inch Sketch Book with a 9B pencil. My drawings keep getting bigger, meaning that I rarely capture anything below the knees. But my scanner limits the size paper I can post. A dilemma! I've been hibernating, recovering from my latest grandchild-transmitted viral infection, so I added another elephant to my series. Gwen Diehn was visiting NYC this week and our group visited Galleries in Chelsea to see exhibits from The International Print Center, Jim Dine, Jean-Michel Basquiat, and Faith Ringgold. 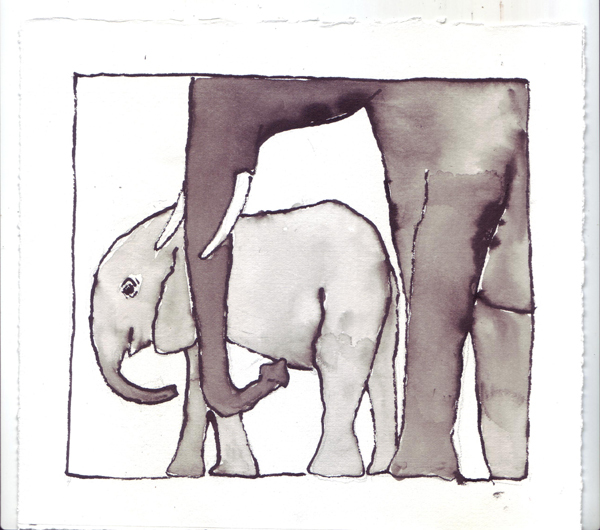 I came home with no drawings, so today I'm posting one more in my elephant series. This Mom and Baby were sketched with Tsukineko All Purpose Craft Ink that I used in a workshop with Judy Coates Perez to "paint" on fabric. The bug on the cover of my recent coptic book was painted with the ink, mixed with aloe vera gel. The ink comes in many colors and is water-based, and non-toxic. I was generous with my lines, but still was shocked at how heavily pigmented and watersoluble it is. 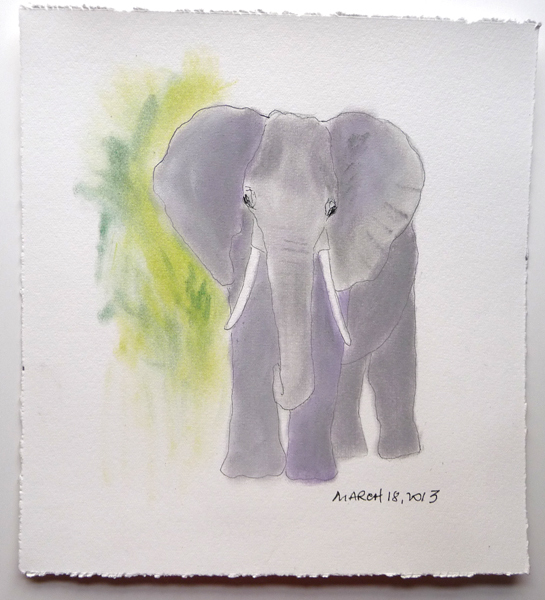 All of the color in the painting was moved from the inked lines with water - and I had to be careful to get the light color gray on the baby elephant. I paused the PBS Nature episode Echo: An Elephant to Remember to get this image. The link is in my last entry and for reasons I don't understand, I can't insert it here too. This concludes my experiments with the inks and pens that I have in my stash. I need to keep digging to see what other rarely used supplies I have to make at least 4 more in the series.